234 pages | 1 B/W Illus. "Ever-increasing numbers of adult patients are seeking treatment for adult ADHD. 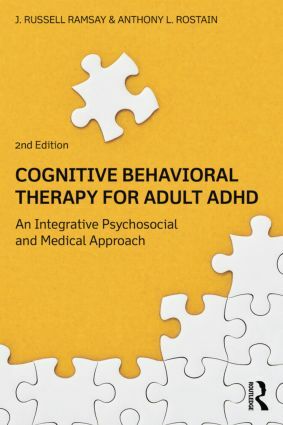 Ramsay and Rostain have again answered the call with their revised and expanded second edition of Cognitive-Behavioral Therapy for Adult ADHD, which provides practicing clinicians with even more clear and detailed guidance for how to carry out an effective course of CBT that can be combined with pharmacologic treatments. This book is indispensable for mental-health professionals and patients alike." "There are only two evidence-based interventions for adults with ADHD, and this book offers one of them—CBT—and was the first in the field to do so. The first edition of this book was a must-have text due in no small part to the widely acknowledged expertise of its authors in the field of ADHD in adults. Cognitive-Behavioral Therapy for Adult ADHD remains a very important source for clinicians wishing to conduct a structured psychosocial intervention with their ADHD patients, alone or in combination with medications. The addition of The Adult ADHD Tool Kit, their patient workbook, adds further value. The updated review of the scientific knowledge about ADHD is state-of-the-art and the detailed discussion of the assessment process as well as the therapy sessions will be a great resource for clinicians and students learning to implement psychosocial treatments for adults with ADHD." "In this volume, two of the foremost experts in the field present a beautifully integrated treatment model that addresses the dysfunctional thoughts, behaviors and emotions that generate distress and impairment for adults with ADHD. Rich with clinical material, it is a treasure trove of insights about adult ADHD and the application of CBT principles and practices that the non-expert and expert alike will find enormously helpful." "In this updated version, Ramsay and Rostain provide clinicians with a wealth of examples and very practical strategies for assessing and treating adults with ADHD. These gifted clinician-researchers describe details of how to develop and follow through on integrated cognitive behavioral and medication treatments, tailoring interventions for emerging needs of each individual patient." J. Russell Ramsay, PhD, is cofounder and codirector of the Adult ADHD Treatment and Research Program and an associate professor of clinical psychology in psychiatry in the University of Pennsylvania’s Perelman School of Medicine. He is cochair of the professional advisory board for the Attention Deficit Disorder Association. Anthony L. Rostain, MD, is cofounder and codirector of the Adult ADHD Treatment and Research Program and a professor of psychiatry and pediatrics in the University of Pennsylvania’s Perelman School of Medicine, where he is also director of education for the department of psychiatry. He is currently president of the American Professional Society of ADHD and Related Disorders (APSARD).